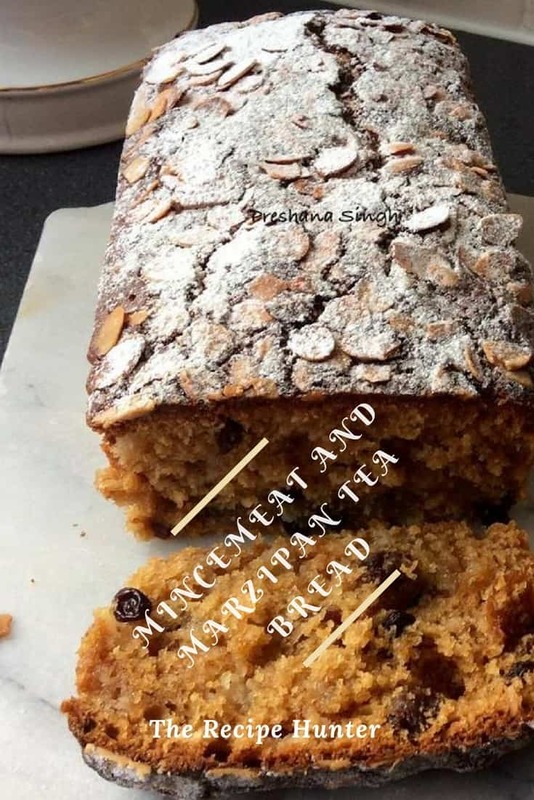 Mincemeat plus marzipan come together in a delicious tea bread. Grease a loaf tin and then line it with some baking parchment. Set aside. Measure the flour and butter into a bowl. Rub in the butter with your fingertips until the mixture resembles fine breadcrumbs. Stir in the sugar and the marzipan bits. Beat the mincemeat and eggs together. Stir this into the flour mixture until it is well combined. Spoon into the prepared pan and level off the top. Sprinkle with the flaked almonds. Bake for 1 hour, until well risen and golden brown, and a toothpick inserted in the center comes out clean. Remove from the oven and lightly dust with the icing sugar whilst it is still hot. Allow cooling in the tin for about 10 minutes before removing to a wire rack to cool completely. Cut into slices to serve.